Developed for use in our space program to give the best possible welds, 3 1/2% Nickel Steel Welding Rod is almost totally free of impurities and flows beautifully to produce an extremely smooth, non-porous weld with Oxy-Acetylene or TIG. Over the years many gunsmiths have asked for this rod to weld bolt handles and other items that will be polished after welding. Thanks to Jim Thompson, Maverick Gun Works of Topeka, Kansas, weve located a supplier of 3 1/2% Nickel Steel Welding Rod.Says Jim, oeI finally located some 3 1/2% Nickel Steel Rod and the first bolt I welded was perfect. 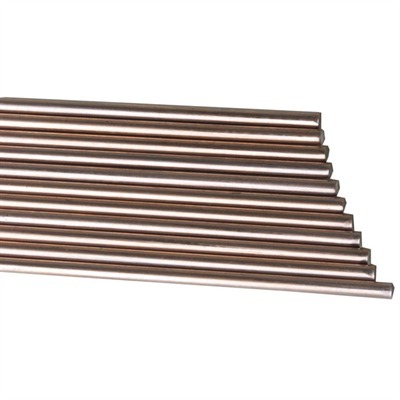 The rod is expensive but worth its weight in gold when you are welding bolt handles and any other job where a perfect we Mfg: Brownells SPECS: Each piece is approximately .094'''' (2.4mm) or .045'''' (1.14mm) diameter, - 12'''' (30.5cm) long. Sold in 4 oz. (113 g), 8 oz. (227 g) and 1 lb. (454 g) paks.